What's going to move your team forward the most? 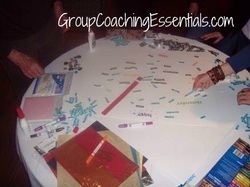 Team Building: Want to take your team from ordinary to extraordinary? Looking for a novel approach to developing your team - one that will stick? Traditional Team Building exercises are fun and intensive. But, do the results always transfer back to the workplace? Stolovich (2000) found that training alone produces 10-30% of desired performance. A majority of our team building sessions include an optional performance coaching component where team members participate in monthly or bi-weekly follow up group coaching sessions (in person or by phone) for 3-6 months after the off-site team building event. This follow up enhances the transferability of new skills and insights back to the workplace. 2. Customized programs developed according to your objectives, your vision, your needs and your culture. 4 Team Coaching - ongoing sessions for your team held over several months, which can incorporate team assessments and coaching. Each team building session is developed in conjunction with the sponsor organization. Programs are designed based on your input around what's important for your team, what's worked well, and what hasn't in past training experiences. The design of programs will also connect with key organizational and leadership issues. We are based in Toronto, Canada and will facilitate programs across North America, the Caribbean and Europe.